Follow the exciting adventures of Commissioner Nayland Smith as he pursues Dr. Fu Manchu across the opium dens of Thames-side London and various country estates. 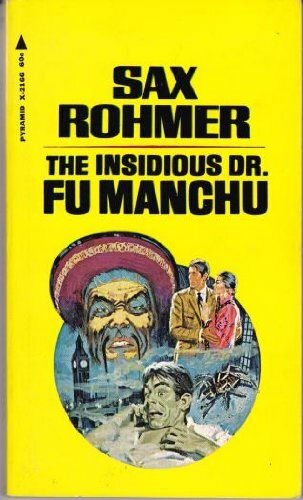 Sax Rohmer's FuManchu novels are a combination of Sherlock Holmes pastiche and anti-Chinese paranoia. by Sax Rohmer - Methuen & Co.
You are in for a ride of adventure, mystical artifacts and bizarre murders. There will be eastern drugs and beautiful women, as well as feats of intelligence and honor. This book is definitely worth the read as part of the overall Fu Manchu series. This book is a 1918 collection of stories by Sax Rohmer, who is best known as the creator of Dr. Fu Manchu. Rohmer's love of all things Egyptian is obvious, and his depictions of the sights, sounds and smells of Cairo make that city come alive. Paul Harvey chats in his office with pal Knox. Colonel Juan Menendez shows them a bat wing someone left for him, and claims someone, seen only as a shadow, watches him. Harvey is plunged into a world of voodoo, vampires and murder. A first-hand description of some of the doings in the slimy, mysterious places of the largest city in England. Here the detectives of Scotland Yard know of many strange things and see the results of the workings of such evil minds as Dr. Fu Manchu.